An H-53 undergoes an engine wash with the EcoPower System on the flight line at Fleet Readiness Center East, Marine Corps Air Station Cherry Point, N.C.
Fleet Readiness Centers East and Southeast engineers are completing the ground work to prepare Naval Air Systems Command for acquisition of a cost-effective and environmentally friendlier technology for cleaning engines. Chemist Keiko Sapp, subject matter expert for Engine Cleaning, and Kami Downey, of FRC Southeast, are in the final phases of performance testing of an engine cleaning technology by EcoPower System that shows promise of reducing water consumption, hazardous material usage and environmental waste and improving engine performance. 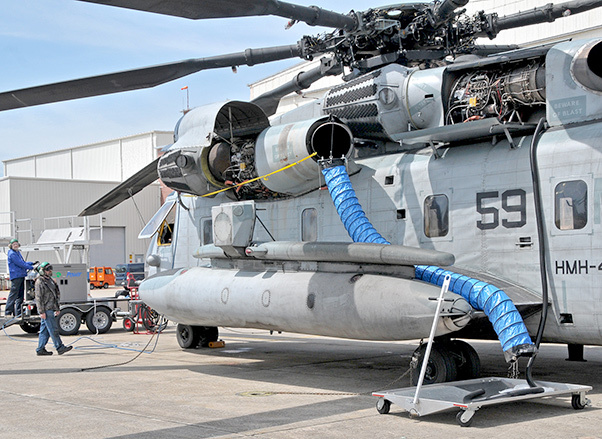 The project has been in the works for about two years and Sapp is spearheading the research and performance testing phase for adopting the system for cleaning engines for the H-53, V-22, AV-8, and also P-8A, T-34 and T-44 aircraft. The research project was approved for funding by the Navy Environmental Sustainability Development to Integration Program after being determined that it meets an enterprise need; the application method complies with environmental laws and standards; and is a viable solution to the need. 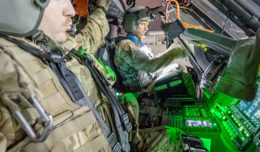 The mission of the NESDI program is to provide solutions by demonstrating, validating, and integrating innovative technologies, processes and materials, and by filling knowledge gaps to minimize operational environmental risks, constraints, and costs while ensuring fleet readiness. The need identified at the start of the project was for a new technology that was a more efficient engine cleaning process, which would reduce environmental impact and improve engine performance. The process also needed to be transportable, to allow for use on Navy ships. She said she began inquiry into the idea in 2015, and partnered with counterparts at FRC Southeast. She said she came across the technology, bookmarked it and returned to the idea after continued research to determine if such a system was a sustainable option. According to Sapp, the current wash process requires a large volume of detergent solution and rinse water delivered via a pressurized wash hose. The alkaline detergent used is reported as being problematic to engines, as its chemical solution introduces possible corrosion when rinsed improperly. The low pressure wash can leave residual contaminants and detergent behind in the engine. The low pressure produces larger streams, improper rinse and a larger amount of run-off. The EcoPower technology uses only deionized heated water. The water is atomized that increases wetting of the surface area and prevents re-depositing of contaminants. Testing specifically looked at total dissolved solids in the effluent or the concentration of minerals and heavy metal elements. The technology also offers long-term cost avoidance, environmental and safety benefits. Its use of deionized water eliminates detergent costs and eliminates hazardous waste. Its recycle system process boosts water conservation and avoids risks of environmental offense. Its mobility and ease of setup reduces labor costs. According to Sapp, the technology’s performance has also proven to be beneficial in the way of engine performance by increasing time-on-wing, decreasing fuel consumption and improving quality of product throughput. “Cleaner engines enhance environmental sustainability and flight crew safety,” Sapp said. Sapp and Downey are laying groundwork to enable swift acquisition of the technology. 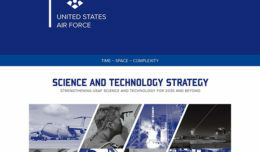 She said the team is also talked with the Air Force who has been having success with the technology for about 10 years.